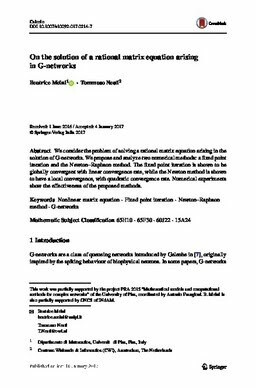 We consider the problem of solving a rational matrix equation arising in the solution of G-networks. We propose and analyze two numerical methods: a fixed point iteration and the Newton–Raphson method. The fixed point iteration is shown to be globally convergent with linear convergence rate, while the Newton method is shown to have a local convergence, with quadratic convergence rate. Numerical experiments show the effectiveness of the proposed methods.